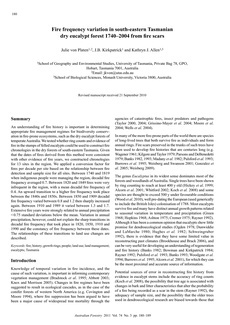 An understanding of fire history is important in determining appropriate fire management regimes for biodiversity conservation in fire-prone ecosystems, such as dry eucalypt forests of temperate Australia. We tested whether ring counts and evidence of fire in the stumps of felled eucalyptus could be used to construct fire chronologies in the dry forests of south-eastern Tasmania. Givennthat the dates for fires derived from this method were consistent with other evidence of fire years, we constructed chronologies for 13 sites in the region. We applied a conversion factor for fires per decade per site based on the relationship between fire detection and sample size for all sites. Between 1740 and 1819 when indigenouos people were managing the region, decadal fire frequency averaged 0.7. Between 1820 and 1849 fires were very infrequent in the region, with a mean decadal fire frequency of 0.4. An upward transistion to a higher fire frequency took place between the 1840s and the 1850s. Between 1850 and 1909 decadal fire frequency varied between 0.8 and 1.2 the sharply increased again. Between 1910 and 1989 it varied between 1.3 and 1.7. Extensive fire years were strongly related to annual precipitation <0.75 standard deviations below the mean. Variation in annual precipitation, however, could not explain the sharp transistions in decadal fire frequency that took place in 1820, 1850, 1910, and 1990 and the constancy of fire frequency between these dates. The reltionships of these transitions to land use changes are described.